You've heard about the health benefits of tea. And you may have heard that certain types of tea can help you lose weight. But are any of the claims true? Science supports some, but not all of the health claims you see. Research, nutrition facts for tea, and calorie counts will help you to decide if drinking tea is any better than drinking water whether it can help you reach your health goals. Tea comes from the Camellia sinensis plant. Even though you'll see many varieties of tea on store shelves, there are only four major categories of tea: white tea, green tea, oolong tea and black tea. The difference between each type is the degree to which each type of leaf is oxidized or fermented. Usually, tea leaves that are heavily oxidized are darker or redder, and teas that are less fermented are lighter or greener. So how does tea nutrition stack up? Tea provides very few calories. It also provides no carbohydrate, protein, or fat. The beverage also does not increase your daily sugar or sodium intake as long as you don't add other ingredients to your teacup. Many hot tea drinkers add sugar, honey, lemon and even cream to their drink. To get the total value of your tea, add the following numbers based on the preparation that you prefer. If you add sugar, add 16 calories, 4 grams of carbohydrate and 4 grams of sugar for every tablespoon that you add. Adding lemon will not significantly change the calorie count of tea. Also, if you add no-calorie sweeteners (like stevia or saccharin) to your tea, the calorie count will not change. And what about flavored tea? Brands like The Republic of Tea, Bigelow, and many other easy-to-find tea brands sell flavored teas, like peach tea, caramel tea, and many other varieties. The calories in flavored tea are usually the same as traditional tea unless indicated on the product's Nutrition Facts label. There is one type of tea, however, that is likely to provide significant calories and sugar. Many sweetened iced teas that you see in delis and convenience stores are very high in sugar. Because most of these beverages provide no nutrition other than sugar, most health experts include these drinks on their list of empty calorie beverages. Experts recommend that you limit the number of empty calories you consume each day. Traditional tea contains polyphenols including catechins, flavonoids, and tannins. Polyphenols are plant-based chemicals that may provide health benefits. Researchers have linked consumption of flavonoids, in particular, to outcomes including a reduced risk of cancer and all-cause mortality in certain populations. However, scientists advise that more research is needed to say for certain if flavonoids can provide these benefits. Some studies have also linked tea drinking to outcomes including improved sleep and reduced stress. But it can often be hard to determine if tea drinking causes people to become more relaxed and sleep better or if people who tend to be more relaxed are also people who tend to enjoy tea. But tea does contain L-theanine, a compound that is used for stress and anxiety relief. Lastly, tea is also linked to mental alertness and improved productivity. Tea contains caffeine which can increase alertness. But it can also create a jittery or nervous feeling. Darker tea, like black tea, usually (but not always) contains more caffeine. Whether or not you get a positive or negative benefit from caffeine can depend on your own level of sensitivity. In general, tea contains about half as much caffeine as a cup of coffee. Herbal tea is different than traditional tea. Herbal teas are made from roots, herbs, seeds and other plant material. Herbal tea drinkers use different varieties to achieve different health benefits. Some of the benefits have been backed by science, but others have not. There are countless varieties of herbal tea. 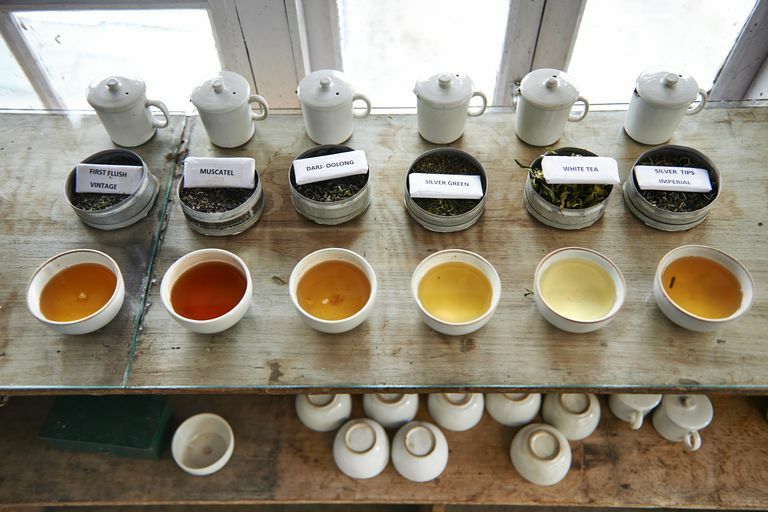 Here are a few of the most popular herbal teas and the science behind the health claims. Chamomile is a popular herb known to have a sedative effect. Scientists believe it may have a mild effect on anxiety and insomnia. Lemongrass tea is often used to reduce stress, calm your stomach or to help you sleep. Some studies have confirmed these findings in animals, but researchers suggest that more evidence is required to confirm these benefits in humans. Dandelion tea is advertised to provide detox benefits. Some people also use dandelion to reduce water weight. Although dandelion has been shown to increase urination, studies in humans have not been able to confirm other health benefits. Rooibos tea provides antioxidants, and some believe it may inhibit tumor growth, although more studies are needed to confirm this benefit in humans. Some people also use it for acne, eczema, and wrinkles but science to support this benefit is lacking. Can Tea Help Me Lose Weight? Many hopeful dieters drink tea, especially green tea, to lose weight. So can this beverage help you slim down? Possibly. But there is no strong evidence to support many of the weight loss claims that are made on packages. And yet, you've probably heard of friends and family members who have lost weight by drinking green tea or taking green tea supplements. It is possible that the products have worked for some. Green tea provides caffeine that may help you to stay alert and active. As a result, you may burn more calories during the day. But it also might keep you up at night. Many weight loss experts promote the positive effects of a good night's rest on healthy eating and exercise. Large studies that have investigated the weight loss benefits of green tea have not been able to confirm that drinking it will improve weight loss. However, if you replace a high-calorie coffee drink with plain tea, you may also be able to reduce your calorie intake and slim down. Cochran N. The Health Benefits of Tea. Eat Right. Academy of Nutrition and Dietetics. Ivey K, Hodgson J. Flavonoid Intake, and All-Cause Immortality. The American Journal of Clinical Nutrition. 2015;101(5):1012–20. Kozłowska A, Szostak-Wegierek D. Flavonoids--food sources and health benefits. 2014;65(2):79–85. https://www.ncbi.nlm.nih.gov/pubmed/25272572. Memorial Sloan Kettering Cancer Center. About Herbs, Botanicals & Other Products. Integrative Medicine. Romagnolo D, Selmin O. Flavonoids, and Cancer Prevention: A Review of the Evidence. Journal of Nutrition in Gerontology and Geriatrics.2012;31(3):206–38.